Did you ever wonder if scripting the complete list of Citrix components with PowerShell is possible? The answer is yes. This article offers a consolidated and complete overview of all Citrix plugins, components and agents and explains in detail how to install them with PowerShell. 23.05.2017: all components updated to their latest versions (e.g. XenDesktop 7.14, Provisioning Server 7.13, etc.) and updated PowerShell code. 16.08.2017: all components updated to their latest versions (e.g. XenDesktop and Provisioning Server 7.15). 10.09.2017: new component Citrix App Layering Agent. 20.12.2017: error correction: PVS target device silent installation as system user does not copy the CFsDep2.sys driver (many thanks to Reinhard Teischl for testing and reporting this issue). 14.01.2018: all components updated to their latest versions (e.g. XenDesktop and Provisioning Server 7.16, WEM 4.5, ShareFile latest plugins, etc.) + error correction and information about new or depreciated features. I also added information about ports and the local firewall. 19.01.2018: error correction: in some PowerShell code snippets in this article the logging function was incorrectly written as 'WriteLog' instead of 'DS_WriteLog'. 17.04.2018: additional information added to various sections regarding installation issues on Windows 10 version 1709 described in the Citrix article CTX229052. 07.05.2018: all information regarding Citrix Receiver has been moved to a separate article: Citrix Receiver unattended installation with PowerShell. For installations: /i "%FileName%" /qn /norestart /l*v "%LogFile%"
For uninstallations: /x "%FileName%" /qn /norestart /l*v "%LogFile%"
Also, in the PowerShell code snippets below, I always use the subdirectory "Files" to store all source files. If you change the name of this folder than please make sure to modify the folder name in the PowerShell script as well. If you see any improvements in any of the examples below than please send me a comment. The same goes for any mistakes you may find (hopefully not too many). I re-checked everything multiple times and I have tested all PowerShell code. This component is no longer needed for Receiver for HTML5 from version 2.0 and higher. Please make sure to uninstall the stand-alone installation of AppSwitcher on your VDA (your worker image) if you have a version higher than 2.0 of the Receiver for HTML 5 installed on your StoreFront server. Reference: Receiver for HTML5 2.4 in the section Client-side appswitcher. 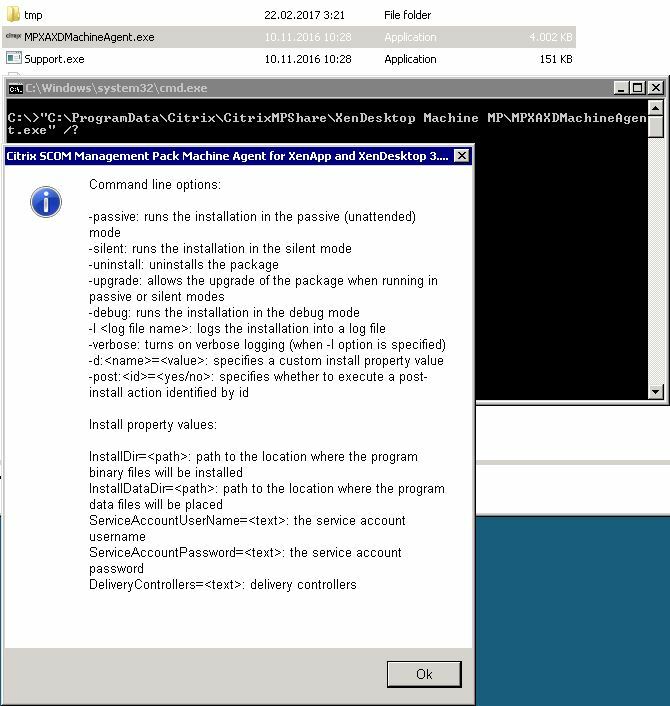 I cover the installation and registration of the Citrix App Layering Agent in a separate article: Citrix App Layering Agent unattended installation. This new tool was initially released by Citrix in February 2017. Connection Quality Indicator is a tool which provides feedback to the user when the network has been impacted to the point that the user’s experience is degraded. Install this component on virtual servers and desktops with the Citrix Virtual Delivery Agent (VDA) installed. This software is NOT intended for the local client device. Yes (for more information please read my article Citrix ADMX files explained). In case you use my installation template, enter the correct log directory and package name in lines 186 and 187. And replace the PowerShell code, for the installation and uninstallation, between lines 215 and 224 with the code below. Please note that the installation parameters provided in this paragraph apply to all previous versions and, most likely, to all future versions as well. However, I strongly recommend to always check the Citrix documentation for any changes in the installation procedure. Existing parameters may have been removed or renamed and new parameters may have been added. Note: I personally do not use the Citrix Connector for SCCM, but I did take a look if the individual components can be automated. And the answer is yes. However, I did not test these installations. I wrote this section so it may be of some guidance to you. Note: this software has not been updated since May 2016 and has been re-issued as-is with each new XenDesktop version since XenDesktop 7.8. This includes the latest XenDesktop release, version 7.16 (released in Q4 of 2017). As per Citrix; "The Citrix Connector allows you to publish applications directly from the ConfigMgr console to Storefront and Receiver via XenApp, deploy App-V packages to XenApp side-by-side with our endpoints, and more." https://www.citrix.com/downloads/xenapp-and-xendesktop/edition-software/platinum-716.html. Go to the section Components that are on the Component ISO but also packaged separately and download the file CitrixConnector_3.1_for_Config_Mgr.exe. After downloading the file, unpack it (e.g. using a program like 7-Zip). All five components can be automated, but it is not always easy and it does not always make sense. The components are installed on different machines types. The ConfigMgr console extension is installed on any machine on which the System Center 2012 Configuration Manager console is installed (R2 or SP1). Before you can install the extension, make sure that .NET Framework 3.5 SP1 and .NET Framework 4.5.2, 4.5.1, or 4.5 are installed. To see the installation options, open a command window and execute the command CitrixConnectorConfigMgr.exe /?. I write should be, because I was not able to get it to work honestly. For some reason, the Console extension seems to need the config data XML (see the next paragraph). The Citrix connector service should be installed on a separate VM in your production environment according to the documentation. Please be aware that I have never tested this. The main issue here is the parameter CONFIGDATAFILE. How do you get this XML file? According to the documentation, the XML file is generated when you create a backup of the configured Connector service. This means that you first have to configure it manually (at least one-time) in order to be able to create a backup from it. You can than use this backup for the installation parameter CONFIGDATAFILE. This component should be installed on servers with Citrix Studio, which in most cases means your Delivery Controllers. However, you can pretty much forget this component. The MSI file CitrixGroupPolicyManagement_x64.msi, located in the folder Citrix Studio extensions in the installation sources, is an old version (2.3.0.0). XenDesktop 7.8 for example has the version 2.7.0.0 installed. In case you do try to install this software, an error message is shown when your system contains a newer version of the Group Policy extensions. 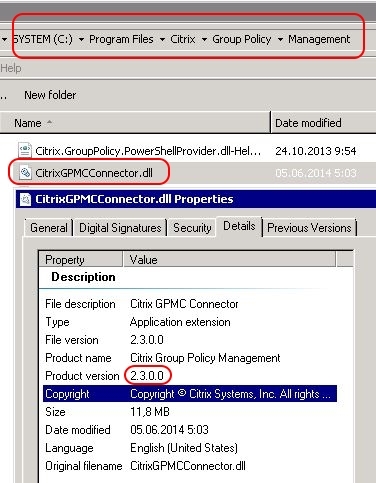 You can check the version of the Citrix Group Policy extensions on the Details tab of the file CitrixGPMCConnector.dll in the directory C:\Program Files (x86)\Citrix\Group Policy\Management on your Delivery Controller. This component should be installed on all XenApp and XenDesktop workers. A prerequisite is that the Microsoft SCCM agent is installed as well. This also applies when creating a master image to be deployed using Provisioning Services (see the document Using Provisioning Services with Citrix Connector 7.5 for Configuration Manager). This is an optional component. The Citrix deployment type handler is required only to deploy Citrix published applications to the Configuration Manager Application Catalog or Software Center on devices managed by Configuration Manager. It is not needed to publish applications to Receiver on user devices. This component can be installed on XenApp and XenDesktop workers as well as on user devices. To enable Google Drive access, you must install the Citrix File Access component (FileAccess.exe) on your VDA and enable file type associations in Citrix Studio." Note: this software has not been updated since July 2016 and still applies to the latest version of Receiver for Chrome. This is currently version 2.6.1 released in January 2018. This component only works in combination with the Citrix Receiver for Chrome. Some additional configuration is needed (e.g. in Studio). Receiver 2.6.1 for Chrome in the section Additional components. Configuring your environment in the section Enabling and disabling access to Google Drive. This Citrix component can be a bit confusing on a couple of levels. Let me try to "unconfuse" you. This component is installed on the virtual server or desktop alongside the Citrix Virtual Delivery Agent (the VDA). On this virtual server or desktop the application Skype for Business is installed as well. This component is installed on the local client (your laptop or desktop) alongside Citrix Receiver. Citrix offers both the Citrix HDX RealTime Connector for Microsoft Skype for Business and the Citrix HDX RealTime Media Engine for Windows in one package called HDX RealTime Optimization Pack for Microsoft Skype for Business. The Citrix HDX RealTime Media Engine for Windows is also available as a separate download. Previous versions of the Citrix HDX RealTime Connector for Microsoft Skype for Business were called Citrix HDX RealTime Connector for Lync. After installation, this software is displayed as Citrix HDX RealTime Connector under Programs and Features in the Control Panel (so without the Skype for Business part). Now that we have that out of the way, let's see how we can create an unattended installation for this component. This component has a direct relationship to the Citrix HDX RealTime Media Engine for Windows, which must be installed on the local client device alongside Citrix Receiver. HDX RealTime Optimization Pack 2.4 for Microsoft Skype for Business. The HDX RealTime Connector for Microsoft Skype for Business is included in this bundle. In case you are using my installation template, enter the correct log directory and package name in lines 186 and 187. This Citrix component can be a bit confusing on a couple of levels. Please read the previous paragraph HDX RealTime Connector for Microsoft Skype for Business before reading this one. Install this component on the local client. This software is NOT intended for virtual servers and desktops with the Citrix VDA installed. This component has a direct relationship to the HDX RealTime Connector for Microsoft Skype for Business, which is installed on the virtual server or desktop alongside the Citrix Virtual Delivery Agent (VDA). HDX RealTime Optimization Pack 2.4 for Microsoft Skype for Business. The HDX RealTime Media Engine for Windows is included in this bundle. As a stand-alone package: HDX RealTime Media Engine 2.4 for Microsoft Skype for Business. Citrix Receiver must be installed before you can install the Citrix HDX RealTime Media Engine for Windows, because they share the same installation path: C:\Program Files (x86)\Citrix\ICA Client. A combined package containing both Citrix Receiver 4.9.1000 (= LTSR) and HDX RealTime Media Engine 2.4 for Windows can be downloaded here. I did not find a combined download package for both the latest version of Receiver (currently version 4.10.1) and HDX RealTime Media Engine 2.4 for Windows. As per Citrix; from XenDesktop version 7.16 or later, you do not have to install the Citrix PDF printer driver. The driver is included in the Virtual Delivery Agent (VDA) installation by default. Reference: Install VDAs.To enable the PDF printer for HTML5 connections, configure the corresponding Citrix policy. This software has not been updated since January 2017 and most likely there will be no future updates. For sure this is not the most widely known Citrix component. So what does it do? Well, as per Citrix: "The Citrix PDF Universal Printer driver enables users to print documents (when being connected using the Receiver for Chrome or Receiver for HTML 5) opened with hosted applications or applications running on virtual desktops delivered by XenDesktop 7.6 and XenApp 7.6. 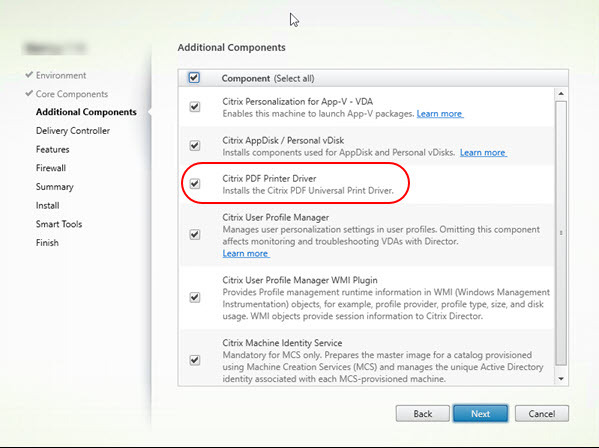 When a user selects the Citrix PDF Printer option, the driver converts the file to PDF and transfers the PDF to the local device. The PDF is then opened in a new browser tab for viewing and printing from a locally attached printer." This component only works in combination with the Citrix Receiver for Chrome or the Citrix Receiver for HTML5. Some additional configuration is needed (e.g. in Studio). See the section Configure PDF printing. Receiver 2.6.1 for HTML5 in the section Additional components. Configuring Citrix Receiver for HTML5 in the section Configure PDF printing. The target device software installs the "Provisioning Server client" on a master target device. The master target device is a VM used to create the ‘golden image'. This golden image, a VHD file, is than streamed to all production VMs using Provisioning Server. The PowerShell script below shows how to use the parameters. In case you would like to run the setup.exe from a command window you need at lease the following parameters: /S /V"/qn /norestart /l \"C:\Logs\Install_PVS_Target_Device_SETUP.log\""
Download and extract the ISO file for Provisioning Server. The installation files for the PVS target device are located in the subdirectory Setup\Device. Installing and configuring Provisioning Services in the section Master Target Device Installation Wizard. Make sure to create the log directory before running the installation. The installation does not create the log directory. In case you run into any installation errors on Windows 10 version 1709, such as the error displayed below, please make sure to check the Citrix knowledge base article CTX229052. Also, make sure to run the Citrix PVS Target Device software before installing the Citrix Virtual Delivery Agent. This variable shows hidden devices on the View menu in Device Manager that are not connected to the computer. This helps when troubleshooting Provisioning Server issues. When running the installation of the Provisioning Target Device software silently and under the local system account, the driver file CFsDep2.sys is not copied to the system. This file, which should be present in the directory C:\Windows\System32\Drivers, is not there, causing an error later on (this does not cause an installation error though!). This issue occurs for instance when using Microsoft SCCM to deploy your software. C:\Temp\PVS_Device_x64.exe /S /V"/qn /norestart /l \"C:\Logs\Install_PVS_Target_Device_SETUP.log\""
After the installation, check the log file and the directory C:\Windows\System32\Drivers to confirm that the file CFsDep2.exe was indeed not copied. If you are interested in automating the installation and configuration of Citrix Provisioning Server, please see the following article: Citrix Provisioning Server unattended installation. All information regarding Citrix Receiver has been moved to a separate article: Citrix Receiver unattended installation with PowerShell. Just a reminder, but the standard Microsoft SCOM agent has to be installed on all servers. I do not use these words often, but this component does not need to be automated . Simply run the Citrix_SCOM_Management_Pack_for_%Product%_%Version%.exe on your SCOM server. The installer has two main jobs. First, the management packs are installed (imported), allowing SCOM to be able to monitor products such as the Delivery Controller or StoreFront. Then, a new share is created called CitrixMPShare in the directory C:\ProgramData\Citrix\CitrixMPShare. This share is required for the installation of the agent and machine agent software. This share contains the installation sources for the (proxy) agent nodes. As per Carl Stalhood; "Several of the Management Packs require an additional agent to be installed on top of the SCOM agent." The Delivery Controllers for example. The standard way to do this is to push the agent to each individual Delivery Controller via the SCOM management console. The executable file MPXAXDAgent.exe in the folder XenDesktop MP in the share CitrixMPShare (on the SCOM management server) is used for this installation. As you can see in the following screenshot, it is possible to script this installation. The question is whether it makes sense or not. As per Carl Stalhood; "To monitor the performance of the VDAs, install the Citrix Machine Agent on any Windows Server 2012 or newer machine (Windows Server 2008 R2 is not supported). This Agent will use PSRemoting to connect to a Delivery Controller to enumerate the VDAs in the farm. The Agent will then use WinRM to pull performance data and session data from the VDAs." The executable file MPXAXDMachineAgent.exe in the folder XenDesktop Machine MP in the share CitrixMPShare (on the SCOM management server) is used for this installation. This installation cannot be pushed from the SCOM management server. You either have to manually install this agent on your dedicated VM or, as you can see in the following screenshot, you can script the installation. As per Citrix: "Session Recording allows you to record the on-screen activity of any user session hosted from a Server or Desktop OS VDA machine, over any type of connection, subject to corporate policy and regulatory compliance. Session Recording records, catalogs, and archives sessions for retrieval and playback". Note: if the port is not specified, the default ports 80 or 443 are used (depending on the selected protocol http or https in the parameter Sessionrecordingbrokerprotocol. From XenDesktop version 7.14, Citrix does not refer to prerequisite services such as Microsoft Message Queuing (MSMQ) anymore. I am not sure why. As far as I can tell, the same Windows Roles and Features still apply to the latest version of Session Recording. Citrix offers a PowerShell script for this purpose, last documented for Session Recording 7.13: https://docs.citrix.com/en-us/xenapp-and-xendesktop/7-13/monitor/session-recording/install-upgrade-uninstall/scripts-to-add-windows-roles-and-features-prerequisites.html. The page contains two scripts. The second one is for the agent. Please make sure to run this script before trying to install the agent. No (outbound communication only; ports 80 TCP (for HTTPS) or 443 TCP (for HTTPS). Since XenDesktop 7.14, Session Recording is included in the XenDesktop installer. Download the XenDesktop ISO file (version 7.16) and extract it. The Session Recording agent MSI files are located in the subdirectories x64\Session Recording (64-bit) and x86\Session Recording (32-bit). Carl Stalhood wrote a very detailed article on how to install and configure the complete Session Recorder infrastructure. I strongly suggest you to read it. When installing the Session Recording agent on a master image for MCS or PVS, you have to make sure that the individual VDAs do not have the same Message Queuing ID (QMId). This is described in the Known issues. Citrix prepared a PowerShell script to address this issue called GenRandomQMID.ps1. This script has to run at system startup and can be downloaded here (you have to scroll down almost to the end). For some reason the /norestart parameter seems to be ignored during uninstallation. I do not know why. As per Citrix: "ShareFile Drive Mapper allows users to connect to their ShareFile account and interact with ShareFile via a “mapped drive” in the Windows file system, without performing a full sync of their content." Install this component on any client device (local client, virtual desktop and/or virtual server). Yes (ShareFileDriveMapper.admx). The ADMX files can be downloaded separately here. For more information please read my article Citrix ADMX files explained. Note: this software has not been updated since April 2016. As per Citrix: "ShareFile On-Demand Sync is designed to provide ShareFile Enterprise customers with an easy way to access and synchronize folders from your ShareFile account to your virtual desktop." Yes (ShareFileSync.admx). The ADMX files can be downloaded separately here. For more information please read my article Citrix ADMX files explained. link to the attachment in the body of the email." Only works together with Microsoft Outlook. As per Citrix: "Some shared files have enhanced security protection, which require special viewing software. Downloaded files can be viewed online using a web-based viewer or on your device using FileSecure software." It is possible to install this software using the command line, but you first have to extract the contents of the main executable file (using a program like 7-Zip). The main executable file contains another, secondary, executable file. This second executable file accepts the following standard MSI parameters: /s /v"/qn"
The PowerShell script below shows how to use the parameters. In case you would like to run the setup.exe from a command window, you need at lease the following parameters: /s /v"/qn /norestart /l \"\C:\Logs\Install_FileSecureLite_SETUP.log\""
The manufacturer of this software is Seclore Technology; not Citrix! As per Citrix: "ShareFile Sync for Windows is designed to provide ShareFile customers with an easy way to access and synchronize folders from your ShareFile account to your local computer." As per Citrix; "The Citrix Supportability Pack is a collection of popular tools [...] written by Citrix engineers to help diagnose and troubleshoot XenDesktop/XenApp products." The Citrix Supportability Pack is a collection of tools packed together in a ZIP file. This ZIP file can be extracted anywhere you like. However, I do not recommend adding the entire contents to a worker image, because it takes up around 400 MB of space. Since you probably will not use most of the tools included, it would be a waste of space. Copy the PowerShell code below starting from line 215. The PowerShell script will copy all directories and files of the Citrix Supportability Pack to the directory C:\Program Files (x86)\Citrix\Citrix Supportability Pack. When calling the script using the uninstall parameter the directory is removed. Citrix User Profile Manager is the Citrix equivalent of Windows roaming profiles, but better. As per Citrix; "Profile management ensures that the user’s personal settings are applied to the user’s virtual desktop and applications, regardless of the location and end point device". The MSI packages for the User Profile Manager agent include two additional parameters, both of which are only relevant when using Group Policy to configure the profile settings (instead of the local INI files). For more information please see the article Install and set up Profile management in the section To install the .msi file from the command line. OVERWRITEINIFILES=YES. This option overwrites all of the changes you made throughout the INI file. INSTALLPOLICYINIFILES=NO. This parameter prevents the installation of the local INI files. Use this parameter in case you plan to configure the User Profile Manager using Group Policy, rather than using the local INI files. Yes. Do not install this stand-alone package when the locally installed VDA already contains the same version of the User Profile Manager. If you do, the installation will end in an error. XenApp 7.16 / XenDesktop 7.16, All Editions in the section Product ISO. Download and extract the XenDesktop ISO file. The installation files for the User Profile Manager are located in the directories x64\ProfileManagement (32-bit) and x86\ProfileManagement (64-bit). XenApp 7.16 / XenDesktop 7.16, All Editions in the section Components that are on the product ISO but also packaged separately. Install and set up Profile management. The latest version of the VDA also includes the latest version of the User Profile Manager. During installation time, it is possible to exclude it. If you do not explicitly exclude the User Profile Manager agent, this software will be automatically installed. In this case, an error will occur when trying the install the stand-alone installation of the User Profile Manager agent. The stand-alone version should only be used when a Virtual Delivery Agent is installed containing an older version of the User Profile Manager agent, or when you installed the Virtual Desktop Agent without the User Profile Manager agent. As per Citrix; "The Virtual Delivery Agent (VDA) enables connections to applications and desktops. The VDA is installed on the machine that runs the applications or virtual desktops for the user. It enables the machines to register with Delivery Controllers and manage the High Definition eXperience (HDX) connection to a user device." Note: the installation of the Virtual Delivery Agent (VDA) is quite complex. I strongly recommend you to read Carl Stalhood's article Virtual Delivery Agent (VDA) 7.16, which offers a very detailed and complete overview of all aspects related to the VDA. The contents of this paragraph applies to all three installation types. Install this component on virtual servers and desktops. This software is NOT intended for the local client device. /components VDA -> this omits the installation of Receiver! This option is not valid when using the VDAWorkstationCoreSetup.exe installer. /virtualmachine -> only use when installing on a virtual machine! /optimize -> only valid when installing on a virtual machine! This parameter executes the Provisioning Services Target Device Optimization Tool which optimizes a number of settings. For more information about optimizing your golden master image, see the article Image Optimization Tools Comparison Matrix. /masterimage -> only use when creating a master image! This option is not valid when using the VDAWorkstationCoreSetup.exe installer. /logpath #LogPath# -> the directory must already exist! In case this parameter is not added to the command line, the default log directory %temp%\Citrix\XenDesktop Installer is used. Default ports: 80 TCP, 1494 TCP/UDP, 2598 TCP/UDP, 8008 TCP (ICA/HDX port for HTML5 receiver), 16500 - 16509 UDP (for Real Time Audio) and 3224 - 3324 UDP for Framehawk. During installation, the required firewall ports on the local system are opened automatically. Download the complete XenDesktop ISO file in the section Product ISO. After downloading and extracting the ISO file, run the AutoSelect.exe to start the installation of XenDesktop. One of the installation options is the Virtual Delivery Agent. Download the stand-alone installation package in the section Components that are on the product ISO but also packaged separately. Install using the command line in the section Command-line options for installing a VDA. Customer Experience Improvement Program (CEIP) is enabled by default. CEIP can be disabled by adding the registry item Enabled (DWORD) in the key HKLM\Software\Citrix\Telemetry\CEIP to 0. Write-Host "CEIP was successfully disabled"
Write-Host "An error occurred trying to disable CEIP (error: $($Error))"
Please note that I am not stating that CEIP should be disabled! I am only showing you how to do it in case you want to. On January 4th 2018, Citrix released a limited hotfix for the VDA 7.16 which solves the following issue: "When a computer policy refresh occurs, random user sessions might disconnect". You can download the hotfix here. Make sure to install the Citrix PVS Target Device software before installing the Citrix Virtual Delivery Agent. This will take care of most installation problems. In case you continue to have issues, please make sure to check the Citrix knowledge base article CTX229052. As of version 7.16 of the Virtual Delivery Agent, the PDF Universal Printer is now included in the installation by default. Reference: Install VDAs. Please be aware that the installation of the VDA requires TWO reboots! The actual installation only starts after the first reboot. When using SCCM I recommend you to use the /noreboot option and add a double reboot in the task sequence. From XenDesktop 7.16, when you install a VDA on a desktop OS, you no longer specify whether to enable standard mode or HDX 3D Pro mode. (The VDA installer wizard no longer contains the HDX 3D Pro page, and the /enable_hdx_3d_pro command-line option is no longer valid.) Instead, the VDA evaluates criteria and sets the mode automatically. If you need to override the automatic mode setting, you can use a new policy setting. For details, see HDX 3D Pro. The command line for the silent installation of the VDA can get quite complicated and long. Citrix released a command line tool that helps you to create the correct command line syntax called Citrix VDA Commandline Helper Tool. 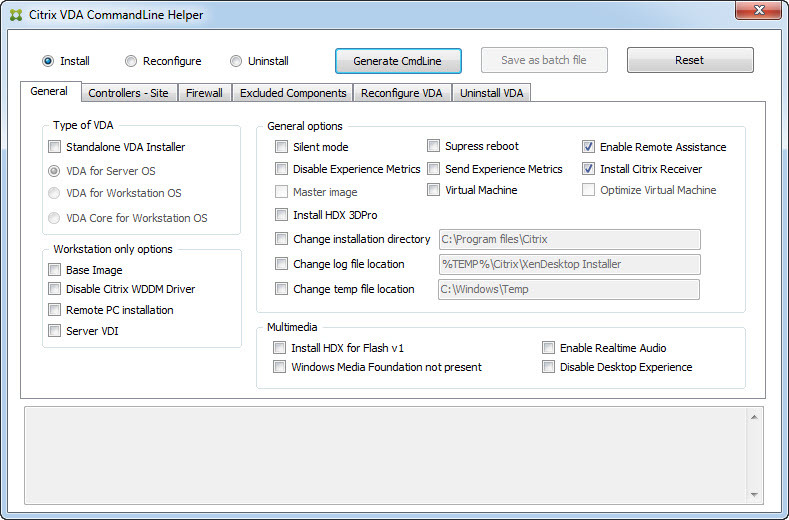 You can find both the description and download option of the tool in the article Citrix VDA Commandline Helper Tool. The Virtual Delivery Agent, Receiver and the User Profile Manager agent:The latest version of the VDA also includes the latest version of Receiver and the User Profile Manager agent. During installation time, it is possible to exclude both components (see Install using the command line). Please be aware that a successful exit code, for both the installation and uninstallation, is 3 (and not 0). I am talking about the exit code of the installer here. The individual MSI files contained within the installer exit with 0 (if successful). Also, the uninstallation takes about 3 minutes. And one last thing, the process XenDesktopVdaSetup.exe may seem to hang for a minute or so, but don't worry, it will terminate by itself in due time. In case you have a complex Active Directory architecture, where, for example, users reside in one forest and the VDA or Delivery Controller in another, you may want to take a look at the Citrix article Successfully Deploying XenDesktop in a Complex Active Directory Environment. You may have to add some registry keys to the Virtual Delivery Agent installation and/or you may need to modify the file 'BrokerAgent.exe.config'. 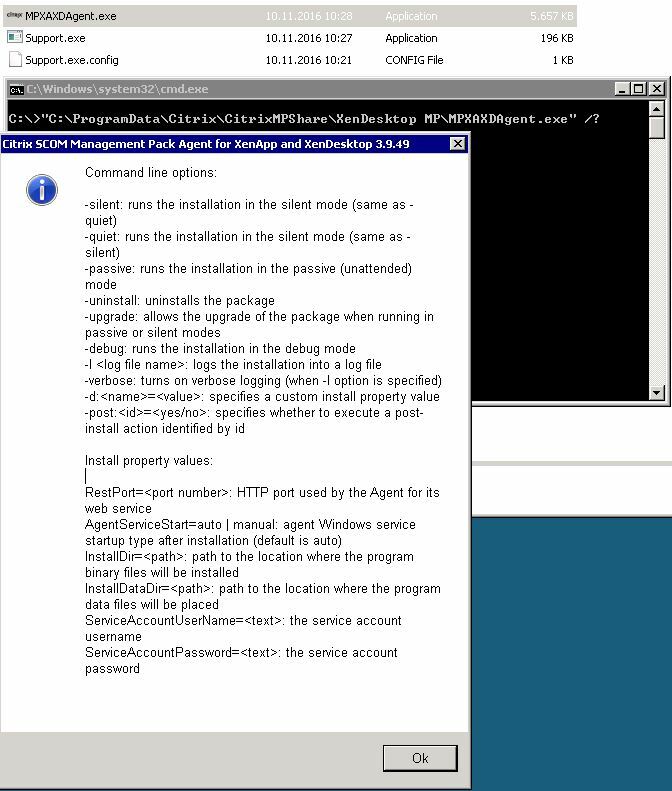 If you are interested in automating the installation and configuration of a Citrix Delivery Controller, please see the following article: Citrix Delivery Controller unattended installation with PowerShell and SCCM. As per Citrix; "Citrix Workspace Environment Management uses intelligent resource management and user profile management technologies to deliver the best possible performance, desktop logon and application response times for XenApp and XenDesktop deployments. It is a software-only, driver-free solution. " There are various parameters you can parse. For a detailed overview of all parameters please check the Citrix Workspace Environment Management documentation. The PowerShell script below shows how to use the parameters. In case you would like to run the setup.exe from a command window you need at lease the following parameters: Setup.exe /s /v"/qn /norestart /l "\C:\Logs\WEM.log\""
Yes (Citrix Worskpace Environment Management Agent Host Configuration v4.0.admx). The typo in the name of the ADMX file is not mine. The ADMX files are included in main Workspace Environment Management installation sources in the subdirectory Agent Group Policies\ADMX. For more information please read my article Citrix ADMX files explained. Default ports: 8286 TCP. During installation, the required firewall ports on the local system are opened automatically. I also strongly suggest to read Carl Stalhood's excellent article Workspace Environment Manager 4.5. In case you run into any installation errors on Windows 10 version 1709, please make sure to check the Citrix knowledge base article CTX229052. Note: this software is obsolete. It has been replaced by the Imaging Wizard. You can only use this software to create VHD files from your Windows 7 and Windows Server 2008 R2 images. For newer operating systems you have to use the Imaging Wizard. As per Citrix: "Citrix XenConvert converts a server or desktop workload from either a physical machine or from another type of virtual machine, to a XenServer virtual machine." Install this component on the device you would like to convert (e.g. your master image). Do not use this tool with Windows 10/Windows Server 2016 or higher. Instead, use the Provisioning Server p2pvs.exe in the installation directory C:\Program Files\Citrix\Provisioning Services. This executable is part of the PVS Target Device software. XenConvert_Install_x64.msi. After the installation some driver files need to be copied manually to the directory C:\Windows\System32\Drivers. For some reason the MSI installer does not install these during an automated installation (I explain this in the text below). Extract both ZIP files to the same directory. By default, in my examples, I use the subdirectory Files to store all source files. You are of course free to use a different name, but than also change the name of the directory in the PowerShell script. And that is it! Now you know how to script all Citrix plugins, components and agents. Thank you for taking the time to read this article. I hope it was of some use to you. This entry was posted in CVAD (XenDesktop) and tagged Connection Quality Indicator, Delivery Controller, File Access, HDX RealTime, PDF Printer, PowerShell, Provisioning Server, PVS Target Device, Receiver, SCOM, Scripting, Session Recording, ShareFile, Supportability Pack, User Profile Manager, Virtual Delivery Agent, Workspace Environment Management, XenConvert by Dennis Span. Bookmark the permalink.